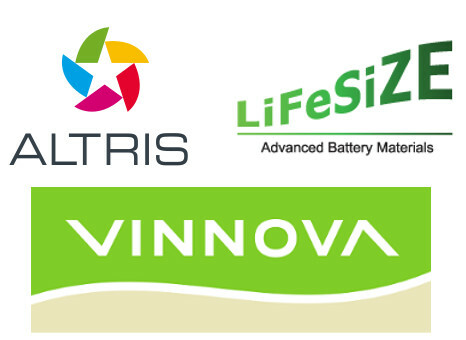 A collaboration between Altris and LiFeSiZE has been granted funding for up to two years from Vinnova. The project, titled “Production of up-scaled Na-ion battery prototypes using a novel cathode material” aims to scale up material production to supply LiFeSiZE with enough material to produce casted electrodes. The ultimate aim of the project is to produce a fuel cell Na battery prototype and evaluate the cells for commercialization. A collaboration between Altris and LiFeSiZE has been granted funding for up to two years from Vinnova. The project, titled “Production of up-scaled Na-ion battery prototypes using a novel cathode material” aims to scale up material production to supply LiFeSiZE with enough material to produce casted electrodes. The ultimate aim of the project is to produce a full cell Na battery prototype and evaluate the cells for commercialization. This project will represent a significant step for Altris as it will be the first step towards reaching the battery market. Access to the casting and battery production equipment at LiFeSiZE will enable rapid progression towards a prototype to demonstrate the market feasibility of Prussian White and Prussian Blue in non-aqueous batteries. The project marks the beginning of continued collaborations with LiFeSiZE with other projects in planning and several Altris employees working out of the LiFeSiZE facilities.